Government Medical College and Hospital (GMCH) is situated in the beautiful city of Chandigarh. Founded in 1991 by Jagjit Singh Chopra, GMCH, Chandigarh is a medical college along with a tertiary care hospital. It is affiliated with Panjab University and is recognized by MCI. GMCH, Chandigarh has been ranked 17th among the top medical colleges in India by Outlook India in 2017. This article will provide all the necessary information related to the admission in GMCH, Chandigarh. It will include details about course offered, total seats, fee structure, cut off marks, contact details etc. The total number of seats sanctioned for a particular course in a college for a year is known as intake. Medical Council of India is the authority which approves the courses and sanction seats to the colleges and universities. Below we have shared the total number of seats sanctioned for all the courses offered at GMCH, Chandigarh. Read more about state wise neet counselling from here. Note- Fee structure is based on previous year’s data and is subject to change as per the rules and policies of the University and State Government. Cut off marks are the minimum marks required by a candidate to qualify an entrance exam. NEET cut off marks depends on the various factors such as- Total number of candidates appeared in the exam, the total number of candidates qualifying the exam, marking scheme, and the reservation provided to the candidates on the basis of the category they belong. The expected cutoff given below is on the basis of current year’s statistics and previous year scenario, therefore, the actual cutoff may vary from given one. 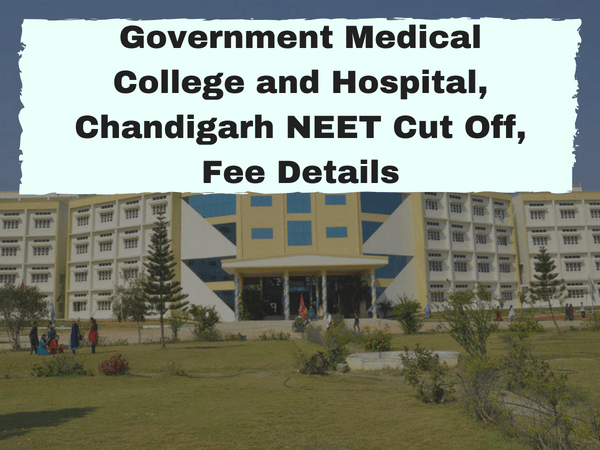 GMCH, Chandigarh grants admission to the candidates in MBBS on the basis of NEET score. GMCH, Chandigarh will release its MBBS merit list after the declaration of All India merit list by CBSE. NEET UG 2019 Counseling for state quota seats in Chandigarh will be conducted probably in the last week of June 2019. GMCH, Chandigarh is the authority that will conduct centralized NEET counseling for state quota seats in Chandigarh. Apart from MBBS, admission in other courses like MD/MS is also granted on the basis of the common entrance exam i.e. NEET PG. Keep visiting our page for more information and updates related to Government Medical College and Hospital, Chandigarh. Do share your queries related to this article with us. You can comment your queries in the comment section below.